Western intel revelations regarding Iranian, Hezbollah activities vindicate Netanyahu's claim Iran building arsenal inside of Lebanon. On Saturday, news broke that Western intelligence sources believe Iran is stepping up its efforts to deliver sophisticated weaponry, including GPS systems meant to turn unguided rockets into high-precision missiles, to Hezbollah in Lebanon. FOX News reported that a Boeing 747 civilian airplane of the Iranian carrier Fars Air Qeshm made an unusual stop in Beirut after flying to Damascus International Airport as flight QFZ9950. The 27-year-old plane then continued as flight QFZ9975 to the International Airport of Beirut to deliver GPS components to Hezbollah, Iran’s Lebanese proxy army. After delivering the components to Hezbollah the Fars Air Qeshm aircraft continued on Wednesday to the Qatari capital of Doha to deliver 74 tons of livestock according to the Lebanese Civil Aviation General Directorate. The Lebanese Directorate denied the Iranian plane had been delivering weapons and GPS components to Hezbollah and said the plane had been “empty of any load” when it landed in Beirut. As usual, the Lebanese authorities are covering up illicit activities by Iran and Hezbollah. The same Iranian Boeing 747 civilian airplane has been caught smuggling weapons and other military equipment to the Iranian-Russian-backed pro-Assad coalition in Syria in July and August this year. In July, the Fars Air Qeshm plane, together with another civilian aircraft from the same company, carried out an unusual flight from an Iranian military base in Tehran to Damascus and from there to the International Airport of Beirut. On Aug. 2, the Iranian Boeing 747 flew directly from Tehran to Beirut and landed two hours ahead of the scheduled arrival. In both cases the Iranian civilian planes carried out unconventional flight routes over Syria according to flight trackers. The directors of board of Fars Air Qeshm includes three officials of the Iranian Revolutionary Guards Corps (IRGC). The company had been out of operations since 2013 before becoming active once more in March 2017. Reacting to the FOX report an anonymous Middle Eastern intelligence official said: "the Iranians are trying to find new ways to smuggle weapons to their allies in the Middle East. They are exploring the West's ability to locate and define smuggling." The news about Iran’s secret weapon deliveries to Hezbollah in Lebanon effectively confirms what Israeli Prime Minister Binyamin Netanyahu told the General Assembly (GA) of the United Nations on Sept. 27. “In Lebanon, Iran is directing Hezbollah to build secret sites to convert inaccurate projectiles into precision-guided missiles. Missiles that can target deep inside Israel within an accuracy of ten meters,"Netanyahu said at the time. “Hezbollah is deliberately using the innocent people of Beirut as human shields. They’ve placed three of these missile conversion sites along Beirut’s international airport," the Israeli leader warned while showing satellite images of the three sites. 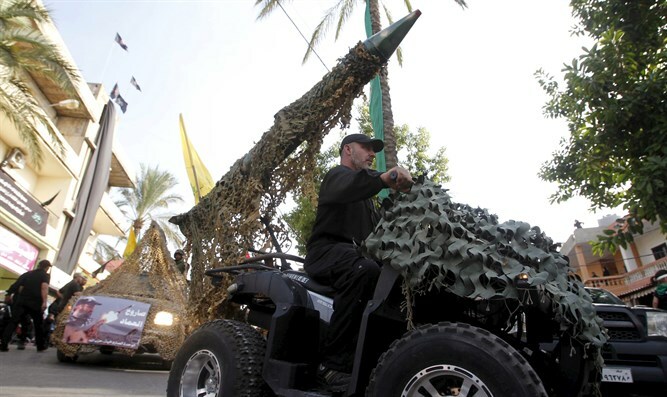 The GPS components Iran delivered to Hezbollah will enable the terrorist organization to convert crude rockets into precision-guided missiles which can strike targets in Israel within an accuracy of 10 meters. The Lebanese government dismissed Netanyahu’s revelation as another attempt to “justify aggression” against Hezbollah and the Lebanese army which has been turned into an Iranian proxy force as well. Days after the Israeli PM delivered his warning at the UN, Lebanon's Foreign Minister Gebran Bassil organized a tour for foreign diplomats to what he claimed were the three sites Netanyahu spoke about during his speech to the GA and said Israel was spreading “lies” about Hezbollah. The Israel Defense Forces (IDF) derided Bassil’s tour noting that three days had passed since Netanyahu’s revelation at the UN, in other words plenty of time to remove evidence of the existence of the secret facilities. “In three days you can clear out a precision missile factory, invite foreign ambassadors, and hope that the world will fall for it,” a statement by the IDF’s spokesmen office read. The IDF later released a video in which it explained what one can do in only three days varying from flying around the world to recovering from a virus or reading an entire book. On Oct. 3 the IDF reportedly sent thousands of WhatsApp text messages to residents of southern Beirut which contained a warning that their homes were in close proximity to another secret Hezbollah missile facility. “Important message. Near your home, a site belonging to Hezbollah has been located for some time. You are advised to take precautionary measures,” the message warned. The Israeli air force (IAF), meanwhile, is continuing its reconnaissance over flights in Lebanese airspace. Lebanon’s National News Agency reported on Thursday IAF planes were once again “roaming airspace over Nabatieh and Iqlim Touffah" in southern Lebanon while on Friday the same agency reported IAF reconnaissance flights over the same area and the Beqa’ah Valley. At the same time, the US Administration upped the pressure on Hezbollah by imposing fresh sanctions on Lebanese companies and individuals providing support to the terrorist organization. The new sanctions came as Congress updated the Hezbollah International Financial Prevention Amendment Act which will now target Hezbollah’s investment fund, its main charity, its real-estate foundation and its global intelligence group. The broader effort is “to deny Hezbollah’s patron Iran from funding its global terror activity, according to the Foundation for Defense of Democracies.